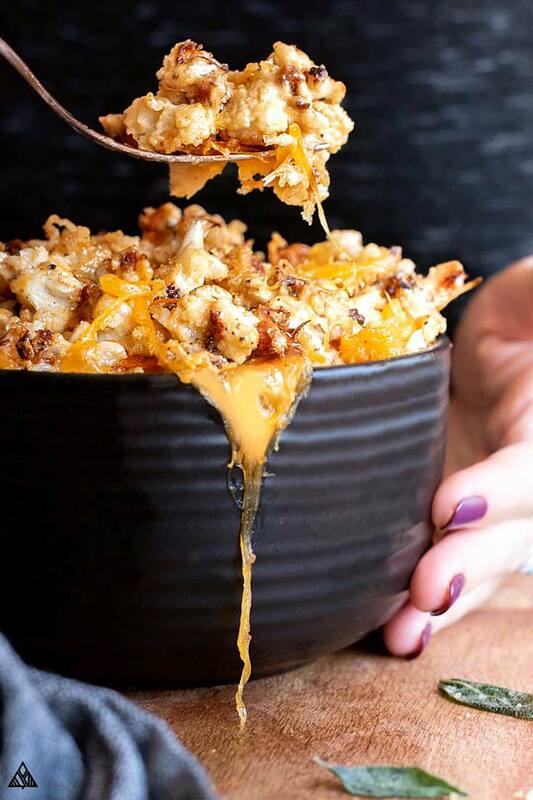 Because this low carb/veggie based dish is even tastier than the traditional recipe — crispy yet soft cauliflower smothered in a deliciously creamy cheese sauce, topped with a crispy crust and baked together perfectly for a cauliflower mac and cheese you’ll never forget! The truth of the matter is, any mac and cheese recipe is all about the sauce — and this cauliflower mac and cheese sauce is where it’s at. 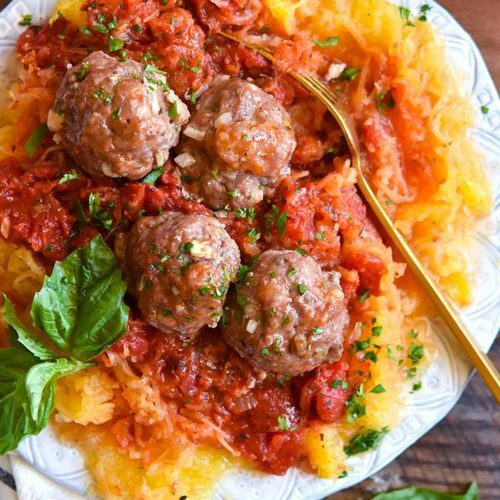 So turn on your oven and let’s get to baking your new favorite low carb dinner! Did you all know there are 44 grams of carbs in 1 cup of mac and cheese?! 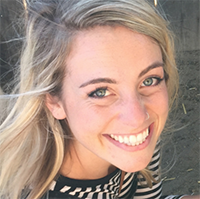 Made the traditional way that is — aren’t you glad you’re sticking to low carb foods?? Cauliflower mac and cheese is ridiculously simple to make! Cut cauliflower into “noodle sized” florets. Toss in olive oil, Italian seasoning, salt and pepper and spread onto a baking sheet. Bake in oven for 25 minutes, or until the florets begin to brown and crisp up. Cook pancetta in a small pan, and drain grease on paper towels. In a small saucepan, add cheddar, heavy cream and butter. Heat on low until everything melts together. Place cooked cauliflower and pancetta in a casserole dish. Sprinkle with crushed pork rinds. Bake in the oven for 10 minutes, or until the top begins to brown. Now that you know the basics, let’s talk about a few tips that will transform this keto mac and cheese from delicious to addicting! Keep a careful eye of the cauliflower mac and cheese sauce while warming it in the saucepan — it can easily burn to the bottom and ruin all your hard work! Heat it low and slow and you’ll be good to go! Don’t cook your cauliflower too long. Mushy/burnt cauliflower in your cauliflower mac and cheese will make this dish significantly less tasty, as overcooked cauliflower is often bitter. Cook it just right, until the tops of your cauliflower begin to brown. If you choose to skip the pancetta, be sure to add some salt to the cauliflower before roasting it! Add a crunchy topping, even if it’s not pork rinds (I know they’re not for everyone). 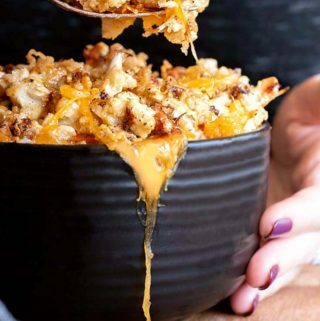 Mac and cheese is significantly more delicious with a crunchy topping! You can sub out the pork rinds for roughly chopped low carb nuts, or another low carb shopping list item. I always double this cauliflower mac and cheese recipe. As easy as this recipe is to make, it takes a decent amount of time. To get the most bang for my buck, I double the recipe and freeze half — see notes about meal prepping below. Swap cheddar for any other meltable cheese — pepper jack, mozzarella — whatever you’d prefer for your very own keto cheese sauce. 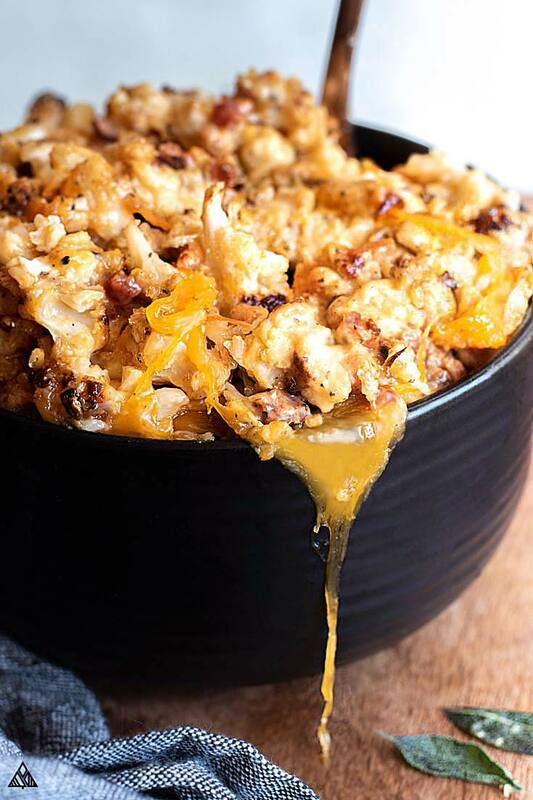 To make this baked cauliflower with cheese a more well rounded meal, add extra protein. You can skip the pancetta, or swap it with bacon, cubed ham, heck even shredded chicken would be a delicious addition to this cauliflower mac and cheese. Be sure to cook any meat before adding it to the dish. Broccoli is a natural complement to this cheesy cauliflower bake, but everything tastes delicious in cauliflower mac and cheese sauce! Try adding some sauteed kale, red onions or mushrooms — it’s a sneaky way to squeeze in more greens. Because I know some of you are curious, making this cauliflower mac and cheese paleo would take some serious adjustments. 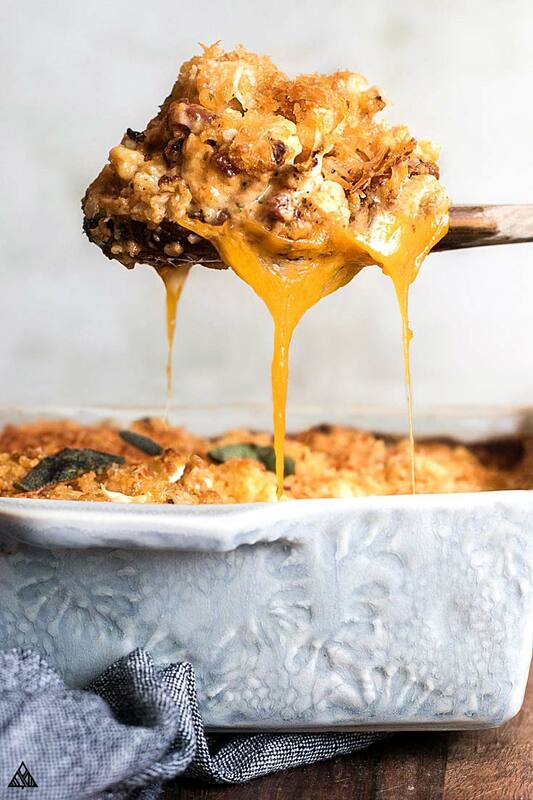 Heavy cream would need to be swapped with one of the low carb milks (almond or coconut), and you’d want to use a paleo cheese substitute instead of cheddar. 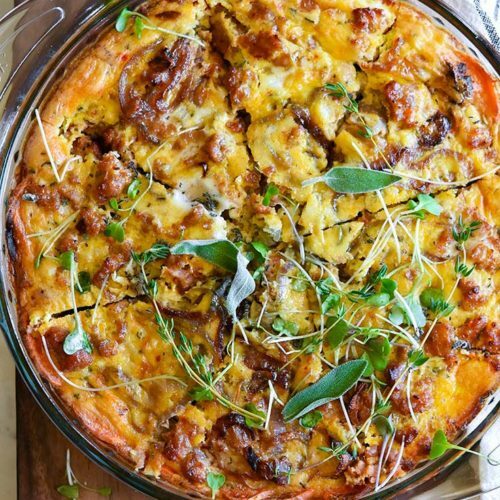 As tempting as it is to eat cauliflower and cheese on its own, most of us are looking for more sustenance in our low carb meals! Thankfully, this cauliflower mac and cheese is one of the most versatile low carb side dishes on the planet: from steaks to low carb fried chicken, really does anything taste bad with cauliflower mac and cheese? Heat it up, serve it on the side, and everyone will be happy! 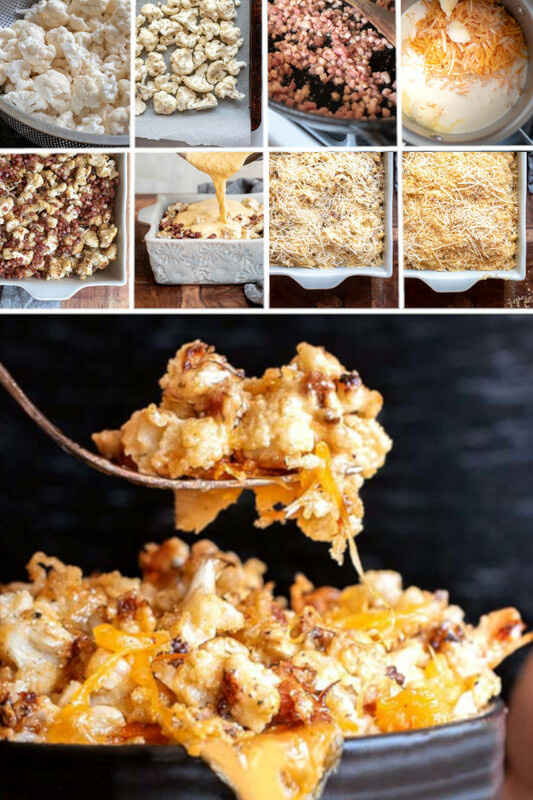 You know I love my low carb meal prep — so obviously I’m going to share with ya’ll how to prep this delicious cauliflower mac and cheese keto style! 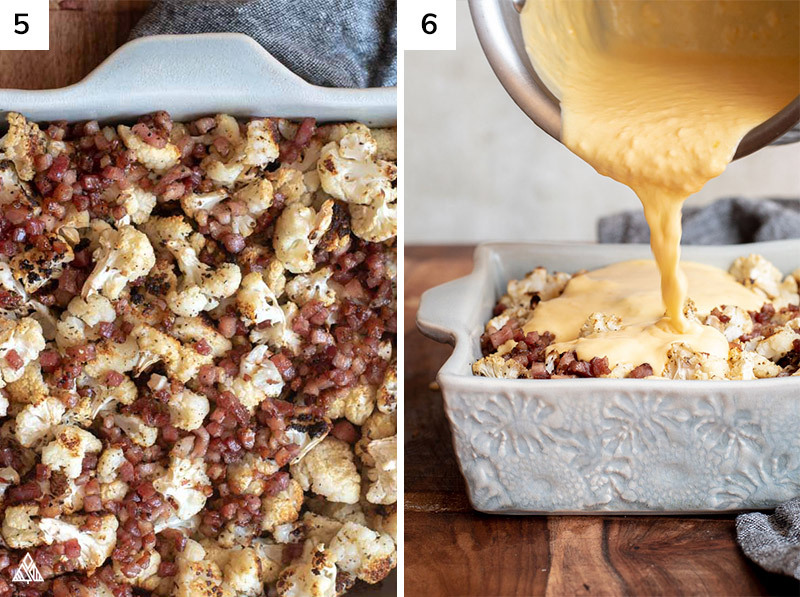 Bake this puppy and allow it to cool — I usually double the cauliflower mac and cheese to save myself some time in the long run. Once cooled, slice into portions. Using a spatula, place each portion into individual resealable baggies labeled with the date made and recipe name. Toss ‘em in the freezer and next time you’re craving cauliflower mac and cheese, all you have to do is bake it in the oven, making sure the top gets nice and crispy! You can even use this low carb cheese sauce with shirataki noodles! Pst – Did I miss your favorite veggie? Let me know in the comments below! 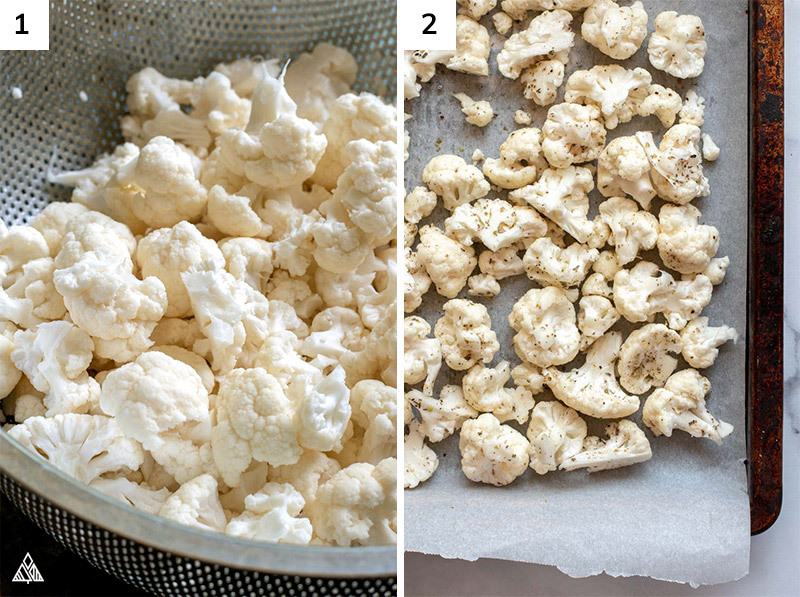 Orrrrr, if you can’t get enough of cauliflower as a low carb substitute, try making cauliflower potato salad, cauliflower tabbouleh or cauliflower stuffing? I’m obsessed! Without further ado, I present to you my favorite low carb cauliflower mac and cheese recipe! I can’t wait to hear what you think — be sure to leave a comment and let me know any variations you tried. Happy cauliflower mac and cheese low carb making! This isn't your average low carb cauliflower mac and cheese, it's cauliflower and pancetta smothered in a delicious keto cheese sauce, topped with a crispy crust and baked together perfectly. Need I say more? 1 Teaspoon Salt skip salt if using pancetta! Cut cauliflower into “noodle sized” florets (about 1”). Toss in olive oil, Italian seasoning, salt and pepper. Spread onto a baking sheet and bake in the oven for 25 minutes, or until the florets begin to brown and crisp up. 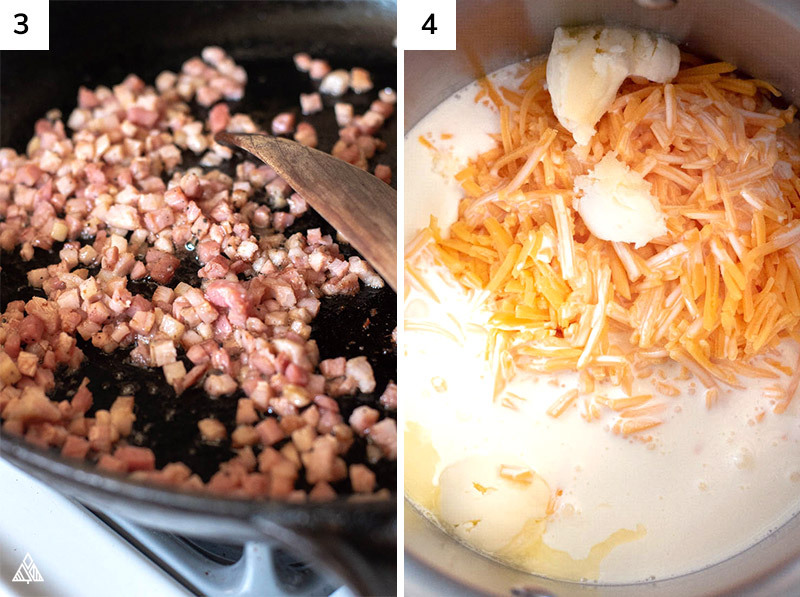 If you’re using the pancetta, cook in a small pan, and drain grease on paper towels. In a small saucepan, add cheddar, heavy cream and butter. 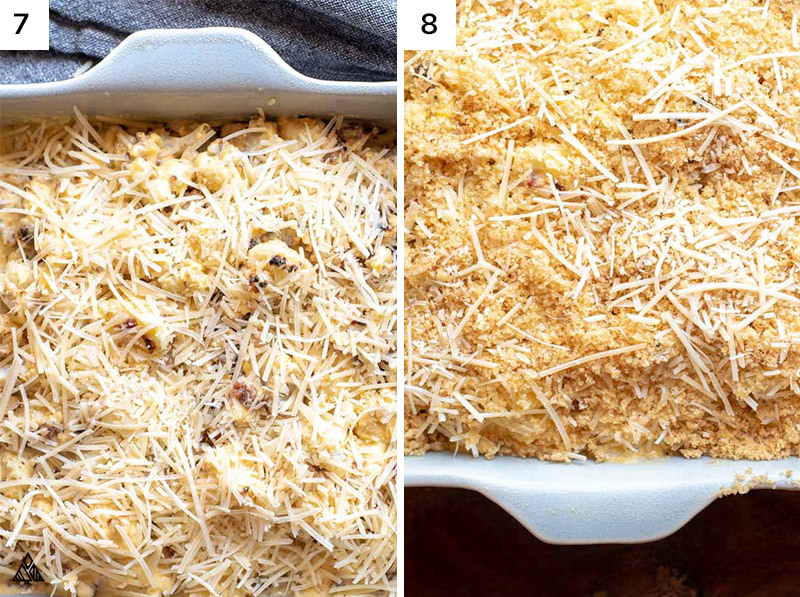 Heat on low until everything melts together — watch carefully as it’s easy to burn the cheese to the bottom of your pan. Remove from heat and stir in cooked pancetta. Place cooked cauliflower in a casserole dish (I use an 8” square dish). Pour cheese and pancetta combo over the top, then sprinkle the parmesan and crushed pork rinds. Bake in the oven for 10 minutes, or until the top begins to brown. Allow dish to cool before serving and enjoy! Leftovers are best reheated in the oven to maximize crispiness! I typically double this recipe and bake this in a larger casserole dish for leftovers. WOW! Is there anyway to make this vegetarian? Hey Scott! 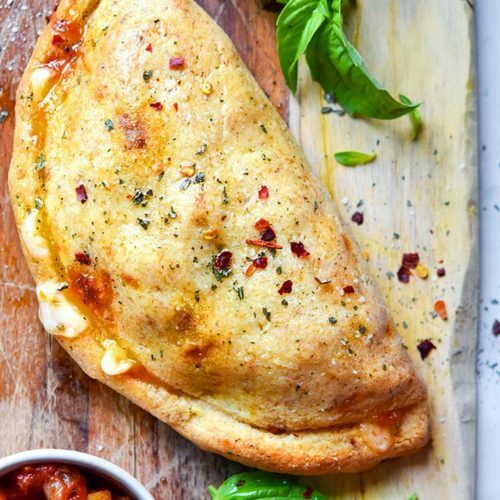 Totally, just skip the pancetta and pork rinds, it’ll be amazing without these! OMG! This looks amazing! Soooo amazing! !